Jordaens is known as one of the 3 great Flemish artists of the baroque, next to Anthony van Dyck and Peter Paul Rubens. On the contrary of them, Jordaens never went to Italy to pursuit an education, as it was accustomed, as he wasn’t interested in it, so he spent his whole life in Antwerp and his style wasn’t influenced by foreign artists. The Dutch noble families had a weird custom: in the feast of the 6th of January, the Day of the 3 Kings, they would cook a pie and hide a bean in it. The one who found the bean became the “bean king”; and he or she would wear a crown and a cloak. 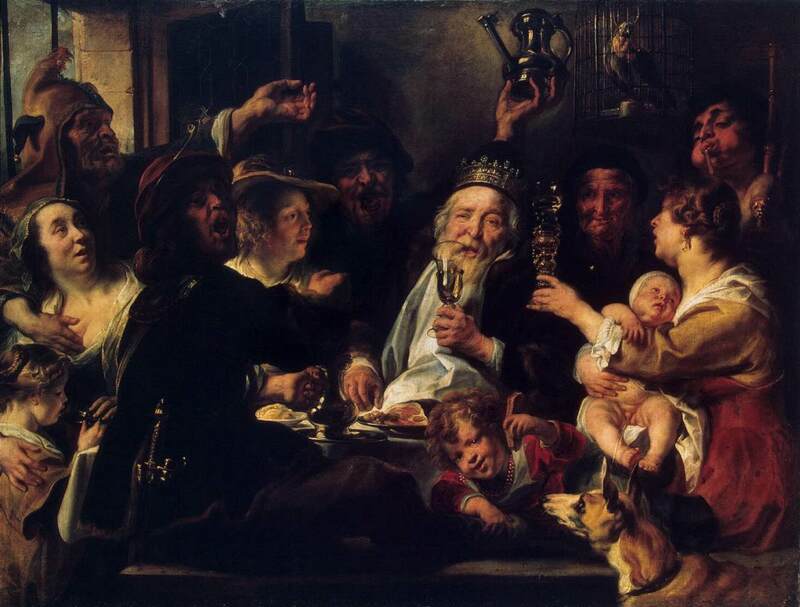 In Jordaens’ painting, we can see the celebration with the “bean king” in the centre, visibly drunk. Despite Jordaens was never appreciated for his portraits, he had an exquisite ability to paint human emotion and character. In the canvas, we can see the joy of the artist’s family, but each one of them expressing it in a particular way: while some lift their glasses quietly, others celebrate passionately. The chiaroscuros in the work are typical of the Dutch painting, but Jordaens uses them in a weird way, especially in the character in the foreground, who shouts towards the spectator. If we take a close look, this character is completely bathed in shadows, which is already curious for a figure in the foreground; but more so if we think the little girl with a red dress next to him, although in the same plane, on the contrary of the man, is completely illuminated. Despite this may be considered an error, many artists (Caravaggio, Rembrandt, de la Tour, among the greatest) use the chiaroscuro not to copy reality, but with a particular goal, whether it be artistic, political or religious. ~ by Álvaro Mazzino on May 31, 2011. This entry was posted on May 31, 2011 at 09:59 and is filed under Baroque.You can follow any responses to this entry through the RSS 2.0 feed.You can leave a response, or trackback from your own site.